The Killers blew up Voodoo with a classic show. Brandon Flowers engaged Voodoo attendees in a characteristically magnetic show. 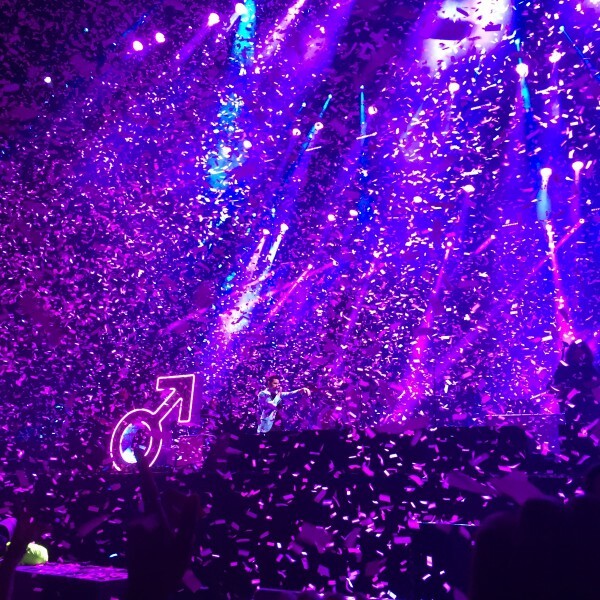 Bringing the trademark combination of glitz, glamour and over-the-top showmanship for which they are known and loved, The Killers closed Voodoo 2017 with a boisterously energetic yet expertly polished performance that made fans new and old smile like they mean it. First thing’s first: The Killers are back. The band that has consistently dominated the billboard charts for the last 10 years with a swaggering confidence has returned with Wonderful Wonderful, an album bursting with characteristic bravado and oozing with refined soul. Wonderful Wonderful is the band’s latest album since 2012’s Battle Born, and the wait was well worth it. Hit singles like “Run For Cover” and “The Man” remind us why The Killers remain at the forefront of the modern alternative rock scene. In an unexpected power move, The Killers kicked off their set in perhaps the boldest manner possible; they opened with “Mr. Brightside”. For four glorious, rapturously nostalgic minutes, the crowd collectively lost itself. Fans young and old, longtime and fake delightedly danced, flailed, and headbanged to one of the most iconic songs of modern music. Frontman Brandon Flowers was at the center of it all. Accompanied by an array of flashy light effects, tasteful backup singers and aptly timed confetti explosions, Flowers commanded the audience from beginning through encore. Though he’s traded in cowboy boots and feathered shoulder pads for dapper, colorful suits, Flowers reminded the audience with his studio-perfect voice and youthful energy exactly why he’s become one of the most recognizable frontmen of the last 10 years. Ever since “Mr. Brightside” made us come out of our cages and do just fine back in 2004, The Killers have occupied a soft spot in all our hearts. Also featuring smash hits “Somebody Told Me” and “All These Things That I’ve Done”, debut album Hot Fuss defined not only the budding alternative rock scene but also the musical awakenings of practically every kid in America. And after all these years, they’ve still got it. The Killers closed their set with “When You Were Young”, another of their genre-defining smash hits. Also included in their setlist were modern classics “Human” and “Runaways”, as well as lesser known jams like “The Way It Was” and “Bones” (the latter of which featured tastefully spooky skeleton graphics and New Orleans’ very own Dirty Dozen Brass Band). The Dirty Dozen also assisted The Killers in a bittersweet tribute cover of the late Fats Domino’s “Ain’t That a Shame?”. In a charismatic, magnetically engaging performance, The Killers closed Voodoo 2017 with a truly memorable live show. When drummer Ronnie “Unstoppable” Vannucci sauntered back onstage after The Killers’ encore in an ape costume, every audience member stood riveted. “Tell your friends”, he said into the mic. And we sure will.